Created by writer Joe Kelly and artist J.M. Ken Niimura, I Kill Giants was first launched as a limited comic book series from Image Comics in 2008, and compiled into a graphic novel in 2009. Now a full-length feature film from director Anders Walter, I Kill Giants tells the story of pubescent girl Barbara Thorson (Madison Wolfe) who spends much of her time focused on the task of luring, trapping and killing the giants that she believes threaten her small coastal town. Barbara has established an elaborate and cryptic protection network of talismans, runes, incantations and shields around the seafront in which she lives, in the nearby forest and throughout the neighbouring town. She feels compelled to slavishly and time-consumingly check on these daily, in case they have been compromised, in addition to keeping a look-out for giants. When Barbara isn’t out setting traps, she sits inside a makeshift tent in her basement, planning and sketching further strategies while listening to audio-tapes of old baseball games. Although clearly an exceptionally articulate and clever girl, she ignores her schoolwork and frequently plays truant. When at school she is the brunt of the female school bully, Taylor (Rory Jackson) who she stands up to with all the verbal imperiousness of a confirmed ‘giant hunter’. Barbara almost invites her outsider status, readily spouting weird proclamations, being rude, wearing dirty clothes and bunny ears as her headgear, while eschewing all modern technological devices. A new neighbour arrives in town, a sweet, shy, British girl called Sophie (Sydney Wade) who is desperate to make friends and unwittingly becomes embroiled in Barbara’s increasingly frenetic giant-killing expeditions. Since giants have become her obsession, Barbara has no time for her older sister Karen (Imogen Poots) the breadwinner of the family. Karen is kind and caring but is overloaded with domestic tasks (which Barbara and her video-game-playing brothers ignore) while trying to hold down a job to pay the bills. Karen has little time to supervise her wayward sister, who is actively isolating herself socially and whose fantasy life is becoming problematic to herself and to those around her. Due to her erratic behaviour, Barbara’s school assigns her a counsellor, the infinitely patient Mrs. Mollé (Zoe Saldana), who perceives that Barbara’s consuming fantasies may be more than just a simple case of a teenager acting up and playing make-believe. Mrs Mollé is as confused and frustrated at Barbara’s behaviour as the viewers are. Rather than keeping her friend Sophie safe (from giants) Barbara is alienating her obliging friend and rebuffing the ministrations of her counsellor. In Barbara’s fantasy, others do not believe in the giants, allowing these creatures to cause mayhem, tragedy and natural disasters unchecked. Back in the real world, people do not understand Barbara and fear for her well-being if she persists in what appears to be her incomprehensible, anti-social behaviour. Barbara is a problematic character – at times we are encouraged to sympathise with her escape into fantasy and role-playing as a way of dealing with her peer problems and some other, as yet unidentified, teen angst. On the other hand, we soon begin to wonder how the adults appear oblivious to the fact that Barbara is clearly a danger to herself and to those around her. Her behaviour starts to resemble less an escape fantasy, as some kind of psychotic breakdown, involving aggression, unsafe activities, the occasional unprovoked physical attack and bouts of arson. We begin to wish that some sensible person might prevail in convincing Barbara to curtail her disturbing antics and take some responsibility for the things that are required in her normal daily life. The combination of Barbara’s fantasy giants (the special-effects for a budget of this size are good) with the mundane elements of her daily life, offer an interesting examination as to how a fragile youngster may fail to cope with the demands, failures, or tragedies that life unfairly throws at them. The final twist explains the reality that Barbara has been attempting to, literally at one point, tune out. When revealed, it does little to increase our sympathy for her. On the contrary, it only serves to indicate how a self-absorbed teen has managed to magnify her own sorrow beyond the very real troubles of her immediate family. The revelation provides emotional resonance, but for her long-suffering relations, rather than for Barbara herself. 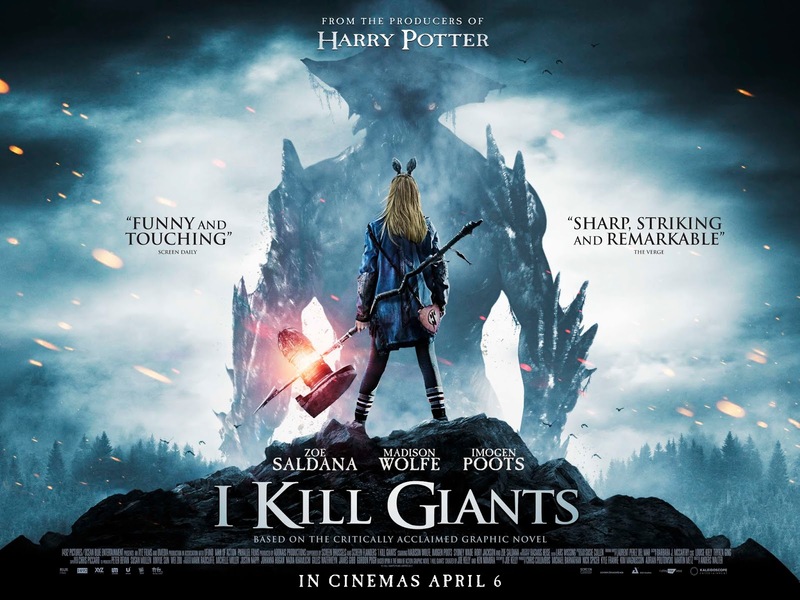 I Kill Giants may also a victim of unfortunate timing – as it deals with what seem to be the exact same themes as the well-narrated, likeable and affecting 2016 movie, A Monster Calls. Both films deal with ostracized school children escaping reality into a fantasy setting in order to cope with the tragedy of the real world. Although there are strong performances from the supporting cast there is limited insight into their lives outside their interaction with Barbara. What we are left with is a difficult, flawed protagonist. With Barbara at the centre of I Kill Giants, the young actor Madison Wolfe is tasked with hinting at hidden depths below a troubling outward demeanour. I’m pleased to say Wolfe succeeds in making Barbara a credible character which plays effectively against the more fantastic aspects of the story. I Kill Giants does offer a family, fantasy adventure that is brave enough to deal with some distinctly adult themes rather than acting as mere light entertainment for kids. (I should mention that, due to some disturbing scenes, this film is more suitable for young teens than for children under ten).